E. Colfax Avenue & Columbine St. 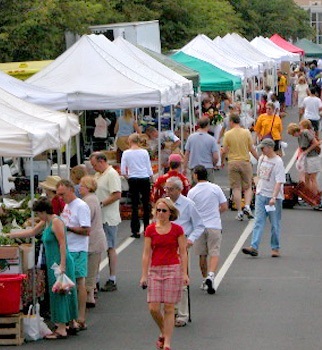 The Farmer's Markets produced by Colorado Fresh Markets are family farmer owned and operated featuring Colorado farm products, specialty food items and everything that's fresh in a fun and festive outdoor shopping environment. You'll find hot food, cool beverages, special events, gardening tips from Master Gardeners and Composters, live music and more. The City Park Esplanade on Colfax Avenue is the perfect spot for a good old-fashioned Farmers’ Market. Around the historic Sullivan Fountain every Sunday through October is a seasonal open air market offering veggies and fruit, as well as flowers, bedding plants, herbs, artisan cheeses, natural meats, gourmet foods and Colorado wines. City Park Esplanade Farmers Market boasts the same vendors as Saturday’s Cherry Creek’s Fresh Market, but is usually less crowded. It’s also a perfect spot for a picnic – just grab some fresh fruit, some bread and cheese and find a nice spot in the sun. The average piece of produce travels 2000 miles before it reaches you and with each day loses more of its nutritional value. Shopping at Colorado Fresh Markets helps local family farmers stay in business, preserves quality local food sources for Colorado while using less resources, and most importantly, provides you with access to the freshest and most nutritious produce available.